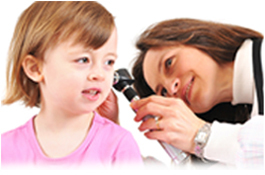 A hole or tear developed in eardrum us usually known as perforated ear drum. Usually this is not considered as a serious matter and it heals on its own after some time. But at times it can cause loss of hearing to some extent. If it does not heal by itself or if it is accompanied by hearing loss there is procedure which can be used as an option for treating the problems caused by perforations in the ear drum. Before going into the details of the problems caused by ear drum problems let us understand the parts of ear and its functions. Ear consists of three portions which are outer, middle and inner portions of the year. Outer portion of the ear which is the visible part of the ear consists of ridged cartilage covered by skin. Sound waves reaching the outer ear travel through the external auditory canal and reach the ear drum, which is a part of the middle portion of the ear. There are three tiny bones (ossicles). The vibrations caused by the sound waves reaching the eardrum causes the eardrum and the ossicles to vibrate and these vibrations are transmitted to the cochlea which is situated in the inner portion of the ear. Cochlea converts the vibrations to sound signals. These sound signals are sent to the brain through a nerve were it is decoded and the hearing process is completed by understanding the intended meaning of the sound. The middle ear portion which is behind the eardrum is filled with air. The eustachian tube which is a tube starting from the back side of the eardrum connects it to the nose. Eustachian tube acts like a passage of from ear to nose. Perforations in eardrum which can be caused by many reasons. Some of them are listed below. Infection of the mid ear which may cause damage to the ear drum and may cause a discharge from the ear drum. A sudden injury which may be caused by a punch or an accident may cause injury to the ear resulting in perforations of the ear drum. The shock waves caused by a sudden explosion may result in the tearing of the ear drum. people who have the habit of poking sharp objects into the ear are at a risk of damaging the ear drum. A doctor diagnosis the existence of perforations in your ear drum by looking at your ear drum using an otoscope which is a special torch used for this purpose. Usually a torn ear drum heals by itself within 6-8 weeks. Ear drum is a skin like structure. Just like a skin cut which heals naturally the torn ear drum also heals naturally. If the doctor fears the possibility of an infection around the ear drum area he may prescribe antibiotics. During the healing period it is better to keep ear drum free from water contact. Your surgeon may ask you to put some cotton wool around the ear to avoid the possibility of water contact. Placing some chemicals which can accelerate the healing process near the torn area of the ear drum is an option practiced by the surgeons. Tympanoplasy is another procedure followed by the surgeons to fix the perforations of the mid ear and to improve the hearing ability.